Inventory We are a resale marketplace, not a box office or venue. Ticket prices may exceed face value. This site is not owned by Keswick Theatre . 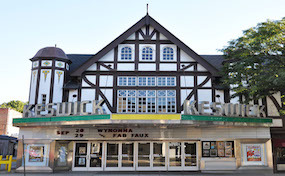 The Keswick Theatre is known for its Tudor Revival facade which is rarely seen on this scale. The residents of Glenside are lucky to have a venue like this to host multiple events. Seating for 1300 provides a small theatre feel while not feeling too small. Concert performances fill the calendar but this is not only a concert venue. The Price is Right is even making an appearance in 2017. Peppa Pig and many other children’s shows will also be available. Comedians love the intimacy of the Keswick and have made many stops during nationwide tours. In 1983 the Keswick was added to the National Registry of Historic places. We are not the official website for the Keswick Theatre Glenside nor do we make any claim to be an agent of theirs. Keswick.TheatreGlenside.com is not a primary vendor, supplier, or affiliated with any official website. We proudly provide access to a large supply and low prices online for all secondary market events. Ticket prices may be well below or above face value and will fluctuate with the market. To purchase tickets for all Keswick Theatre Glenside events simply click on the show of interest or call our operators at anytime.